70 km on the road of Chittaurgarh to Bundi lies Menal, in the district of Chittaurgarh. A place full of natural beauty, Menal is famous for its ancient Shiva temples, picturesque waterfalls and dense forests. The word Menal is derived from Mahanal, a great Chasm or cleft. 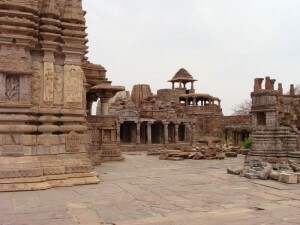 Menal was the centre of art and architecture during the Chauhan period. Chauhan rulers of this region were followers of Shaivism and because of their patronage Menal became a great centre of Shaivism. The magnificent temple of Mahahnaldev, named after this place was built in around 10th or 11th century A.D. and is famous for its architecture. Menal is mentioned as a place of pilgrimage in the Bijolia rocked inscription dating 1170 A.D. after the reign of Chauhans, Menal came under the Guhilas of Mewar. This entry was posted in Menal, Rajasthan and tagged Holy Place. Bookmark the permalink.